The issue I see is sealing, in many ways the blow forward bolt operates on the same principle with a different geometry. So THATS what its called, eh? Originally, the loop on the right side was not there and it fed air from the top right. A mechanical actuator lifted the valve open and it DID have a rather strong magnet on it to retain the BB until the other valve was open (not shown). Edit: Machining a nylon 'bolt' should give you a small enough clearance to not have to worry about leakage. Either that or a lot of little teeny O-rings to exasperate the crap out of you. Oh, and thanks for the compliment. I 'automated' this valve for a bbgun made from nothing but brass fittings and tubes a couple of years ago. I just needed Jack's talent for encasing the whole thing in epoxy to make it look/handle well. kenbo0422 wrote: Machining a nylon 'bolt' should give you a small enough clearance to not have to worry about leakage. Either that or a lot of little teeny O-rings to exasperate the crap out of you. The Girandoni system - upper two images show tubular ball magazine on right side of gun, distinctive loading block traversing the receiver. 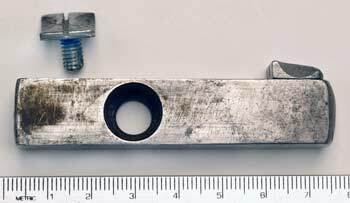 Note that receiver casting is a single top piece. Again notice the smooth transition in lines between the receiver and the air reservoir in this authentic specimen. Lower image shows the sliding loading bar with its ball socket and with the right hand retaining screw removed. 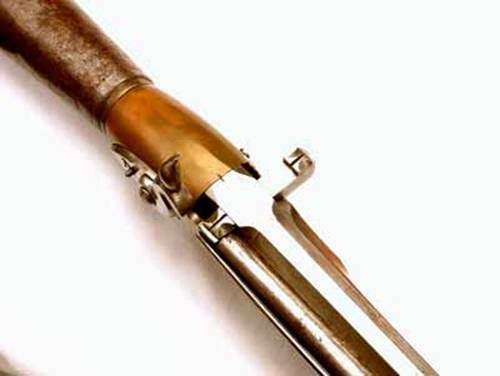 These loading bars were tapered so precisely that, before the magazine spring was added during reassembly, the bar would slide into an airtight battery position by its own weight! It looks promising that you show. I wish I could duplicate myself, two hectmarr, to try it. Excellent! Will that mechanism pulse the airflow or will the spring loaded piston just start farting from the pressure applied? I would imagine it to open just enough to release the pressure, and stay in that position until the pressure is removed. Labtecpower wrote: Will that mechanism pulse the airflow or will the spring loaded piston just start farting from the pressure applied? I would imagine it to open just enough to release the pressure, and stay in that position until the pressure is removed. Hadn't you seen the original subject of this thread in action? 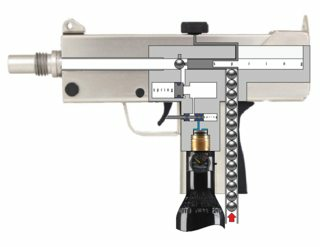 The stepped piston is the key, emptying the firing chamber faster than the trigger valve can fill it, allowing the piston to re-seat, thus building up pressure in the firing chamber again for the cycle to repeat. Labtecpower wrote: Would be pretty easy to tune if you'd use pressurized air instead of a coil spring behind the piston. You can definitely use a Crosman grip unit to run something like this... as long as the trigger is pressed it will cycle in full automatic. Far too many variables and far too fiddly. I think something a little more conventional is appropriate. Sounds good! could you shoot? The speed of the cycles what you do not like? If you had joined the forum a little earlier you would have called it a "fart machine"
The rate of fire is too high as-is and frankly I don't have the patience to fiddle with it, so I'm going to move to something else.